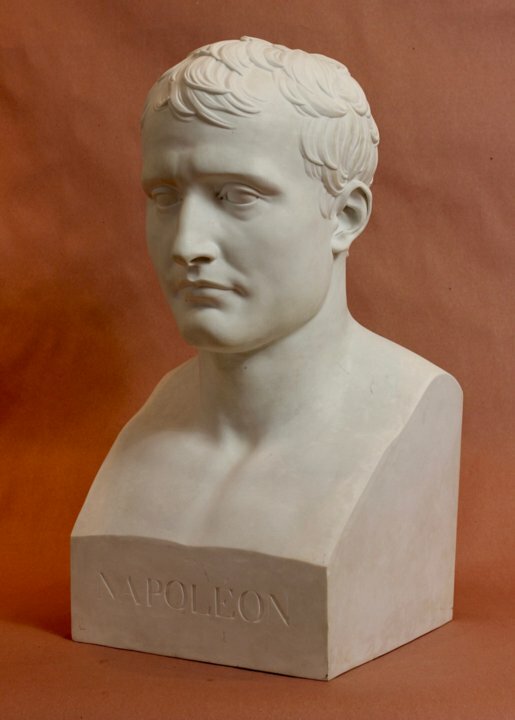 Fine and rare large Sèvres biscuit bust of Napoleon by Denis-Antoine Chaudet. The model was executed in 1804 and the first Sèvres piece was made in 1805. Brogniart, the head of the manufactory, wrote in a report that because of its size the piece was very difficult to make. Few versions exist in this size, only five were successfully fired in the first three years. “A. B. 17 at. 10”: Either for Alexandre Brogniart, head of the manufactory, or for the sculptor Alexandre Brachard and the date 17 August 1810. Other examples are in the Boston Museum, The Detroit Institute of Arts and the Pitti Palace. The Pitti Palace version is identically inscribed, but is dated “18. 6. 7”. The Detroit version is dated “6 dec. 1810”.